“Chris Amendola and Dan Armstrong remember crouching, crawling and wriggling through a series of dusty brick tunnels beneath their office in an old carpet factory in Toronto’s Liberty Village. 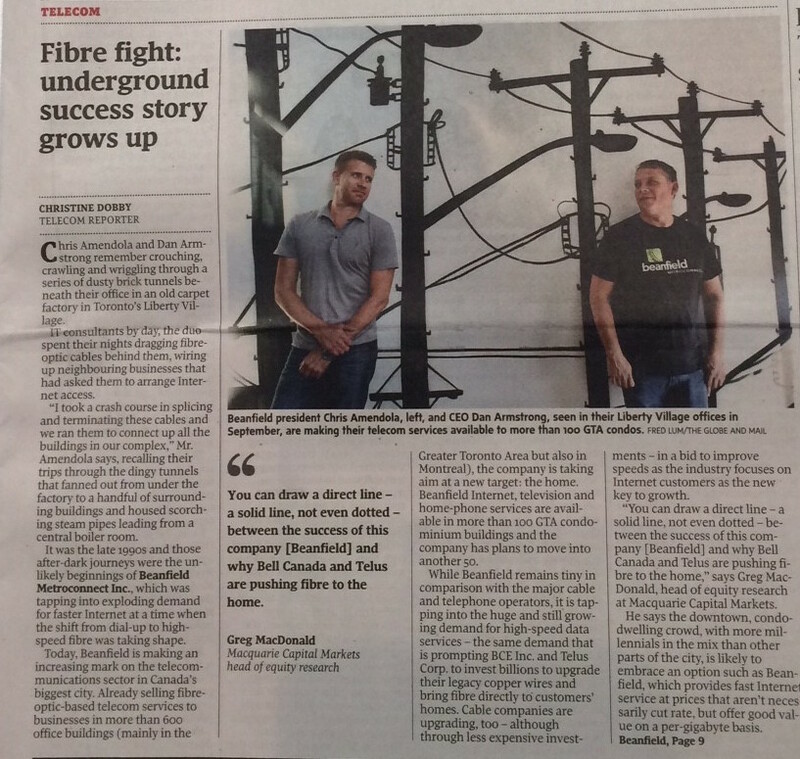 IT consultants by day, the duo spent their nights dragging fibre-optic cables behind them, wiring up neighbouring businesses that had asked them to arrange Internet access. “I took a crash course in splicing and terminating these cables and we ran them to connect up all the buildings in our complex,” Mr. Amendola says, recalling their trips through the dingy tunnels that fanned out from under the factory to a handful of surrounding buildings and housed scorching steam pipes leading from a central boiler room. It was the late 1990s and those after-dark journeys were the unlikely beginnings of Beanfield Metroconnect Inc., which was tapping into exploding demand for faster Internet at a time when the shift from dial-up to high-speed fibre was taking shape.